Aquarius Blog: Snippets Turned into More Snippets! It is time for the fortnightly visit to the Pixie Snippets Playground again and this time I've actually gathered together some snippets and cut them into even smaller snippets!! You might have guessed by now that I'm very fond of using the Pixie Powders for backgrounds and usually work on fairly large pieces of watercolour paper which I cut down as required until pretty well every scrap is used.The diagonal die was used to cut a purple layer and I then used the interior part to cut a piece of the 'pixied' paper, carefully saving all the little strips, chevrons and triangles. The purple piece was put onto a background before popping all the coloured bits into the spaces - some would say I'm mad to fiddle with this I'm sure!! 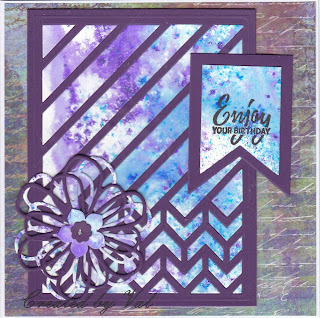 The sentiment was stamped onto yet another snippet of the background paper and cut along with a purple layer using banner dies. I'm also trying to use up the tail ends of lots of 6" paper pads and luckily this piece was just the right colour. Finally a layered flower was die cut and apart from some really tiny pieces I've used all the Pixie paper with these colours. Time for another sprinkling/spritzing session I think! 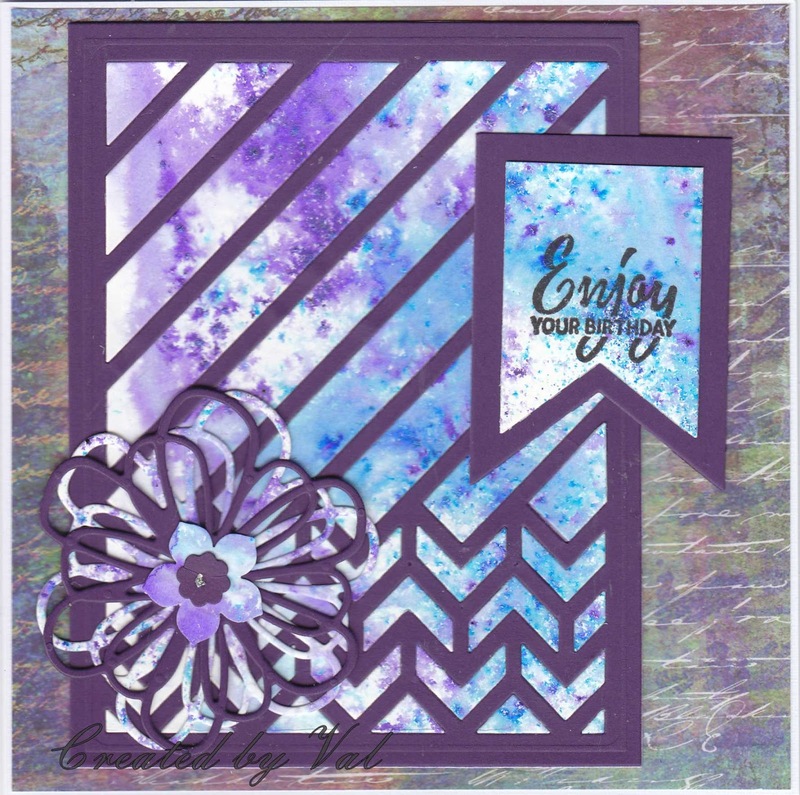 Do take a look to see what Di has made to inspire us and as usual she has given several tips on the best way to put the card elements together for a good result. Lovely to see you in the Playground bright and early today! this is such an effective use of that die - might be on a list now!